The Skegness Natureland Seal Sanctuary is on the North Parade near the SunCastle and bowling greens. There are a small number of on-road parking spaces directly opposite and we were fortunate enough to park there. It’s only a short walk from the rest of the attractions including the pier and funfair. Outside of the seal centre there is a public toilet block with basic baby changing facilities. I think that the only baby changing facilities inside Natureland are in the female toilets, although when they complete the new building then there will be unisex facilities. The admission fee is reasonable at £5.50 for adults and our baby was free. You can also (at time of writing), get a: Free Childs Ticket Online. This is only a little more expensive than the Mablethorpe Seal Sanctuary. The main attraction is obviously the two Seal pools and Seal Hospital that occupy the central area of the Natureland. These include underwater viewing areas, and have lower glass areas suitable for pushchairs and wheelchairs. These do get busy during the feeding times and we went early to the first feeding to get a spot, and then had to rush around for the subsequent ones which follow straight on afterwards. 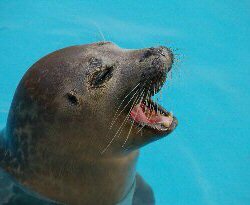 First it’s the main seal pool, then the penguins and finally the younger seal pool. Other attractions include a reptile building, including two crocodiles; a greenhouse with floral displays flamingoes and tropical birds; aquariums, fish pond and a pets corner. It is possible to buy food for the Koi-Carp and to feed the goats etc. Food facilities currently involve a sandwich bar with a sheltered, but outdoor area. We therefore ate at the SandCastle restraunt in the direction of the pier. They are currently constructing a new restaraunt building which will provide a nice place to eat along with good toilet including baby changing and disabled facilities. The centre is a bit more commercialised than the Mablethorpe Seal Sanctuary, but as a result the place looks more formal and the buildings look better. 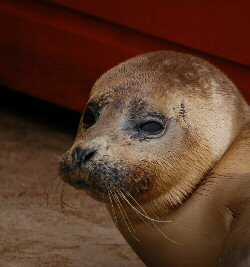 The Skegness Natureland Seal Sanctuary is well worth a visit. This was my third visit and I’ve looked forward to every visit. This entry was posted on Saturday, June 24th, 2006 and is filed under Babies, General, Holiday, Tourism. You can follow any responses to this entry through the RSS 2.0 feed. Both comments and pings are currently closed.